Rabbi Harold Schulweis, z”l, contributed to the recently published “Keeping Faith in Rabbis.” He died December 18, 2014, at the age of 89. What is the job of a rabbi? We can all think of many things based on our experiences. A rabbi often functions as service leader, preacher, teacher, spiritual counsellor, manager, writer, mediator, strategic planner, fundraiser and many more. The modern rabbinate continues to evolve. In 21st Century America, we have to ask how contemporary challenges that our Jewish community faces will shape the rabbinate and how the rabbinate must respond to challenges to shape the Jewish community. 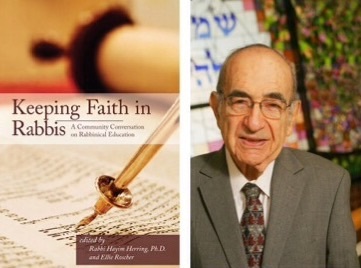 A new book, Keeping Faith in Rabbis: A Community Conversation on Rabbinical Education, edited by Rabbi Hayim Herring and Ellie Roscher, is a collection of essays that explore the evolving American rabbinate. I am proud to say that I am a contributor to this volume with the publication of my essay “The Roar of the Cat Rabbi: The Vital Role of Introverts in the Congregational Rabbinate.” In coming weeks, I hope to discuss my essay further. For now, I want to turn to another essay in the book, “The Loneliness of the Rabbi,” by Rabbi Harold Schulweis. Rabbi Schulweis died on Thursday at the age of 89. He had an illustrious career as the Rabbi of Valley Beth Shalom, a vibrant Conservative synagogue in Los Angeles. I did not know him personally but was inspired by his writing and teaching. He was a powerful and engaging speaker, a brilliant yet accessible theologian and a passionate advocate for social justice. He was a Gadol Hador, one of the giants of the Jewish world in our generation. In his essay in Keeping Faith in Rabbis, he addresses rabbis directly as to their sacred duty. There are many things that a rabbi does, but based on Rabbi Schulweis’s teaching, I would like to suggest a common purpose among our various forms of service: the rabbi’s job is to guide others to seek out and discover God’s presence in one another and in our world. When we help others achieve this and add meaning to their lives, we are successful. Let’s address these questions. Our ancestors saw miracles in the story of Hanukkah, but differed on precisely what the miracle was. There are two separate Hanukkah miracles described by different voices of our tradition. In our liturgy, we say the prayer Al HaNissim, which praises God for the miracle that delivered a military victory of the weak over the strong, the few over the many, the pure over the impure, and the righteous over the wicked. In the Talmud, however, we find the legend of the single cruse of oil that miraculously burned for eight days instead of just one. Our tradition gives voice to both of these founding myths, and both are valid and important. So, what does Hanukkah have to do with the central episode of the Joseph story that we read this Shabbat, Parashat Mikketz? They always fall together, but why? On the surface, this is a pure coincidence. Our Torah reading cycle was not coordinated with the cycle of festivals and special days on the Jewish calendar. For this reason, we have the separate Maftir Torah reading and special Haftarah reading that are singled out today for Hanukkah. Nevertheless, our annual mingling of the story of Joseph in Egypt with our commemoration of the Maccabean revolt against their Greek oppressors, begs for closer examination. The Joseph story is itself the most naturalistic narrative in the Torah. On the surface, God is not an active player. Every event can be read in purely naturalist terms in its descriptions of human behavior. We have sibling rivalry, parental meddling, deception, lust, political ambition, guilt, and revenge. We recognize these experiences from our own lives, and we identify with the characters as a result. At the same time, there are just too many coincidences in the story for it to be entirely arbitrary: Joseph’s brothers sell him as a slave, which leads to his serving in the house of Potiphar, which leads to his imprisonment, which eventually leads to his interpreting Pharaoh’s dreams, which leads to his appointment as Pharaoh’s #2, which leads to Joseph’s brothers coming to bow down before Joseph, begging for food. God is never described by the narrative as the direct cause of this chain of events, but Joseph attributes everything to the hand of God and forgives his brothers as a result. In the Joseph story, God’s presence is well-hidden. God never speaks but is portrayed as working all along, though in ways not apparent to most of the actors. Joseph himself ascribes God’s role in orchestrating the chain of events in his life that ultimately leads to his reunion with his family and his forgiveness of his brothers (Gen. 45:5). Rabbi Neil Gillman notes a parallel between the Joseph story and the Hanukkah story. If we look at historical accounts of the second century BCE, we find not only the persecution of the Greeks toward Jews, but the internal struggles between the Maccabees and the Hellenists, Jews who sought to live completely immersed in Greek culture. It is a story rife with political intrigue, assassinations, and civil war. The Maccabees emerged as the winners during this period of great strife. On the one hand, their story can be told in naturalist ways: the story of an oppressed people rebelling against an imperialistic kingdom, fighting to regain their freedom and their right to worship as they wished, and winning because of their military might and political sense. It was only subsequent generations, starting with the Maccabees themselves, who interpreted the series of events as miraculous, the work of God’s hand in human history. We see an interesting phenomenon in the Joseph story and in Judaism’s response to the Maccabean revolt. In both cases, God is seen as having played a role in the unfolding of events, even as God’s presence is not readily apparent at the time the events are happening. By extension, the coincidence of Parashat Mikketz and Shabbat Hanukkah is perhaps not a coincidence at all. It may be our tradition’s way of saying that God is present throughout our lives. Our openness to seeking out and being aware of God’s presence is a step towards adding meaning to our lives. Rabbi Harold Schulweis helped countless numbers of Jews encounter God’s presence through guiding them to discover God’s presence in other people. In the process, he helped bring fresh meaning to modern American Judaism. On this Shabbat Hanukkah, I pray that we will follow the example of Rabbi Schulweis. Let us tap into our human ingenuity and compassion to bring about good in the world so that future generations will look back at us and say that through our efforts God performed miracles.